This might seem like a rather dull part of the film making process, but I can’t emphasise enough how important it is to document all the relationships and deals you enter into regarding your film. 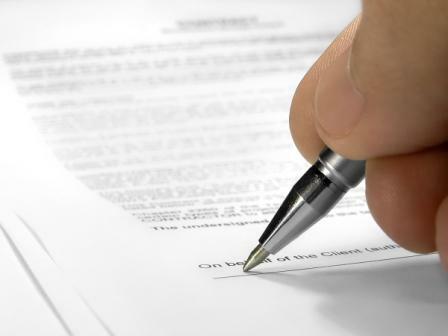 Contracts are legally binding agreements, spelling out the terms and clarifying all details expected by both parties. Consider them your best friend as they ensure that everyone is on the same page and that there are no misunderstandings down the road. They also provide the necessary paper trail you need when securing distribution deals. Each one of course varies depending on the role or job in your film, but they should all detail the terms of payment and the situation regarding expenses. There are many free contract templates available on line that you can tailor to suit your project. Equity contracts are great and cover everything so where possible, it’s a good idea to base your contracts on theirs. Keep them simple though and if possible get a solicitor to give them the once over. Also when sending contracts always include a SAE to ensure prompt returns. This contract confirms our agreement that you will take the part of ............... in the film "Ambleton Delight” a joint production of Parkes Productions and Sinéad Ferguson (henceforth referred to as the ‘Film’). We are letting you know in advance that the title of the film may change, but if it does, we will let you know by sending a letter to this address, making clear that the name change will not affect our agreement. I, ................ will make myself available for the rehearsal dates when confirmed and the shoot dates ............... (night/morning)............. I will also make myself available on the following dates should I be required to do so. I, ................. hereby grant Parkes Productions Ltd and Sinéad Ferguson the right to photograph me and to record my voice, performances, poses, actions, plays and appearances, and use my picture, photograph, silhouette and other reproductions of my physical likeness in connection with the Film. I also hereby grant Parkes Productions Ltd and Sinéad Ferguson, its successors, assigns and licensees the perpetual right to use all still and motion pictures and sound track recordings and records which may be made of me or of my voice, and the right to use my name or likeness in or in connection with the exhibition, advertising, exploiting and/or publicizing of the Film. I further grant the right to reproduce in any manner whatsoever any recordings including all instrumental, musical, or other sound effects produced by me, in connection with the production and/or postproduction of the Film. Additionally, I agree, to the best of my ability, to make myself available should it be necessary, to rerecord my image/voice and/or record voice-overs and otherwise perform any necessary sound work required after the end of filming.